This project is my entry for Julia Bobbin’s popular Mad Men Challenge. I’m a huge Mad Men fan and love seeing the costumes every week, so entering this popular challenge was a bit of a no-brainer for me. The dress I chose was Betty’s cream and green shirt dress. I couldn’t find any references to which episode this is from, but I’ve seen it so many times online that I think it must actually be a promo shot for the first series. It’s more late fifties than early sixties and embodies Betty’s conservative housewife look from the first half of that series. If you know which episode this is from, leave me a comment and let me know. I’m starting with a sheet that I got from Oxfam in Streatham. 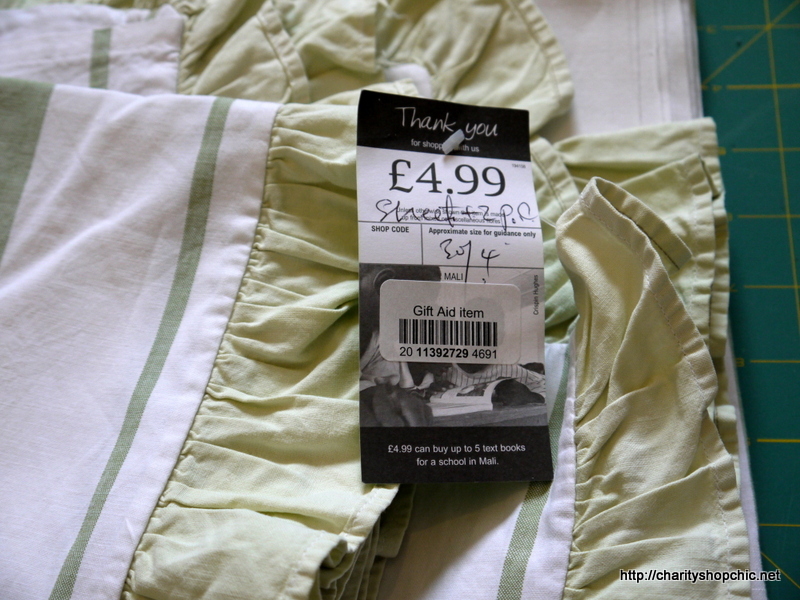 I paid £4.99 for the single sheet and two matching pillowcases, which have green ruffles all the way around! It’s made of actual linen, the thin refined sort (none of your thick slubby stuff) and handles beautifully. The sheet had a couple of labels with numbers on glued onto it. Anyone know what these might have been for? Let’s take a closer look at Betty’s dress. The top half is like a blouse, buttoning one side over the other. There are small, dark buttons. 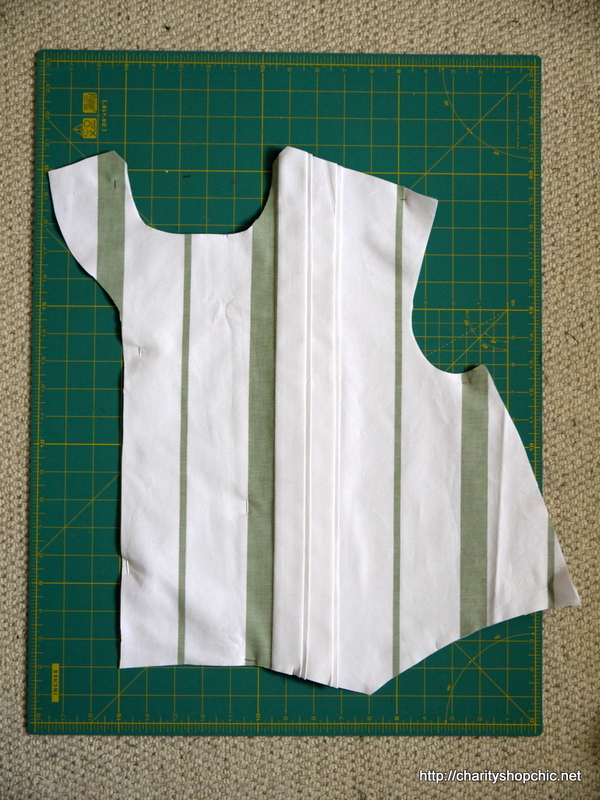 The stripy fabric has been tucked several times to bring the stripes closer together on the bodice front. The bodice darts are pointing inwards – towards each other – which is unusual! They are cutting off the tucked section. The collar has a horizontal stripe. There’s a bit of green visible around the arms. No sleeves. The skirt is very full and is box pleated, rather than gathered, with the green stripes on the top. There is a matching green belt with a small buckle. 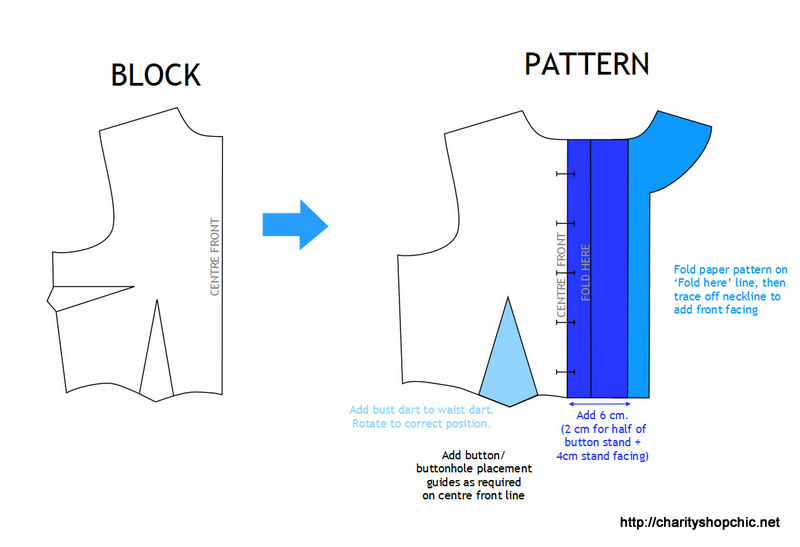 I drafted a very basic pattern for this using my block. 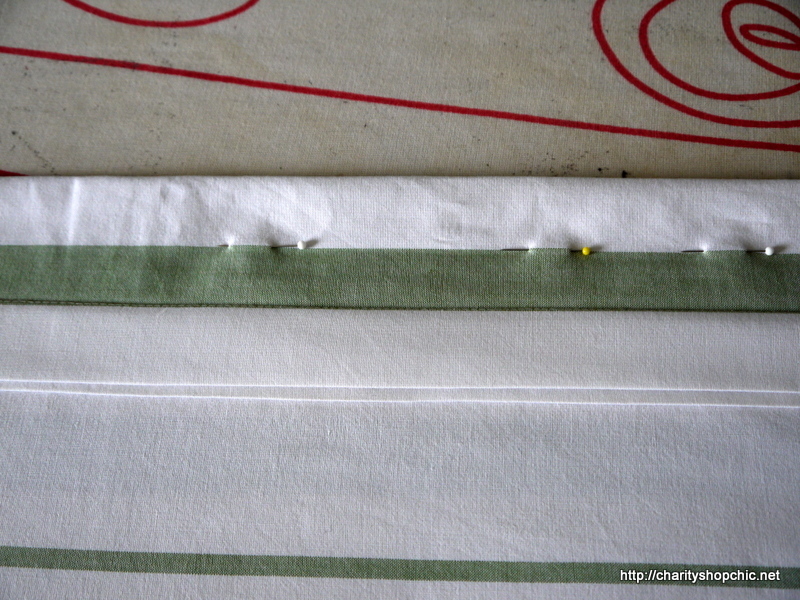 A little dart manipulation here, add a placket there, grow on a facing… hey presto! 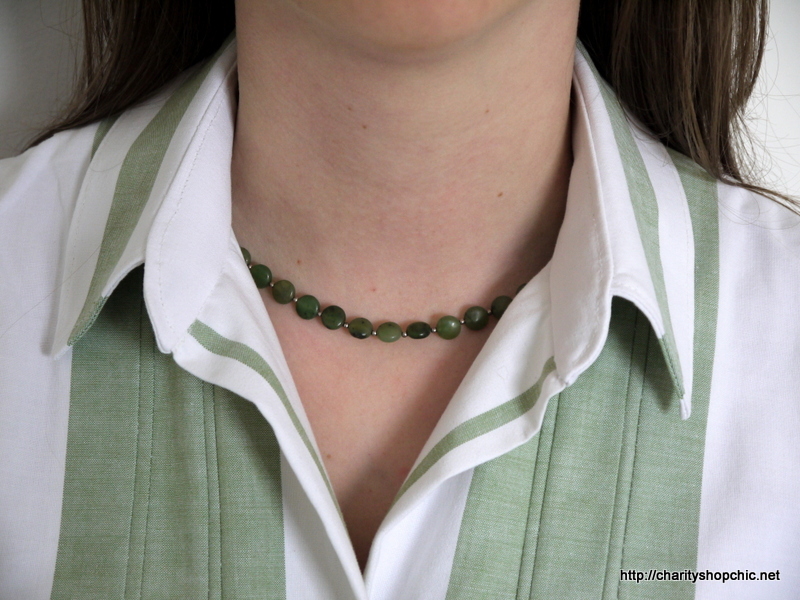 I copied the collar and collar stand from a blouse that I already own. I just used my basic back block for the back. 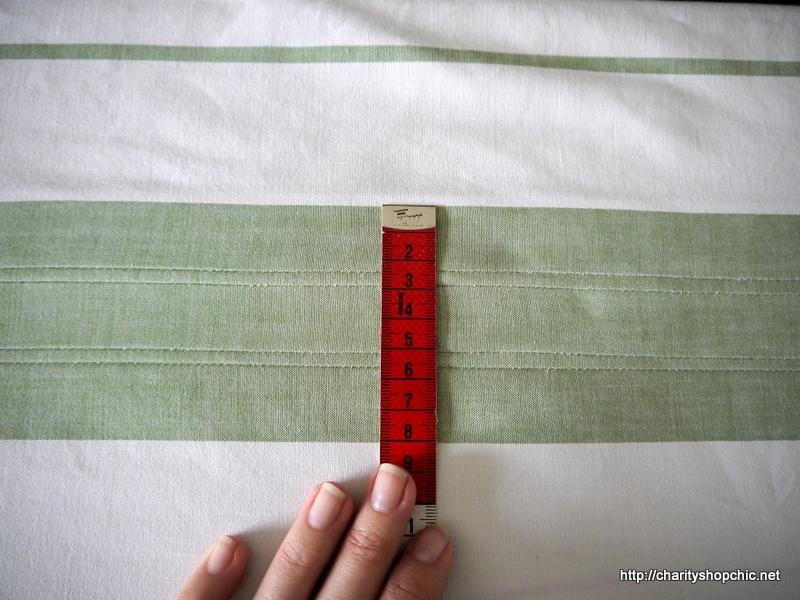 …so I figured that three big stripes plus two small stripes would make 8.5 cm total, and be about right. I tore off a length of sheet long enough for both left and right fronts and started tucking. 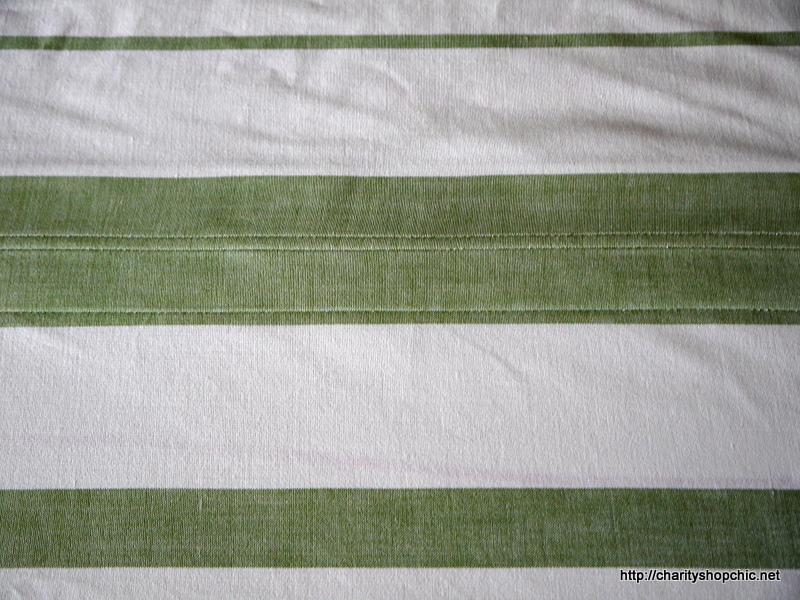 Because I overlapped the green stripes ever so slightly when taking my tucks (to make sure no white was showing), I ended up with a green section of around 8 cm. 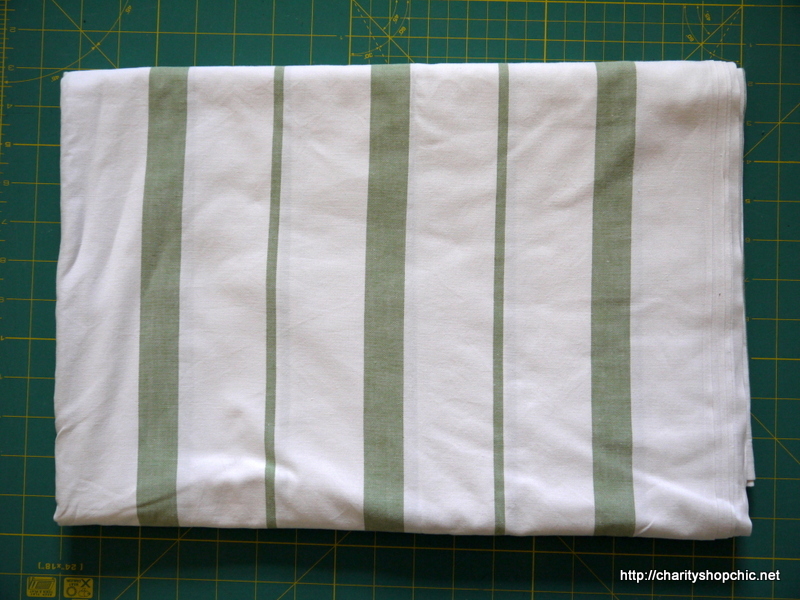 I folded my tucked material in half lengthways, making sure the stripes matched all the way up, and cut out my fronts. 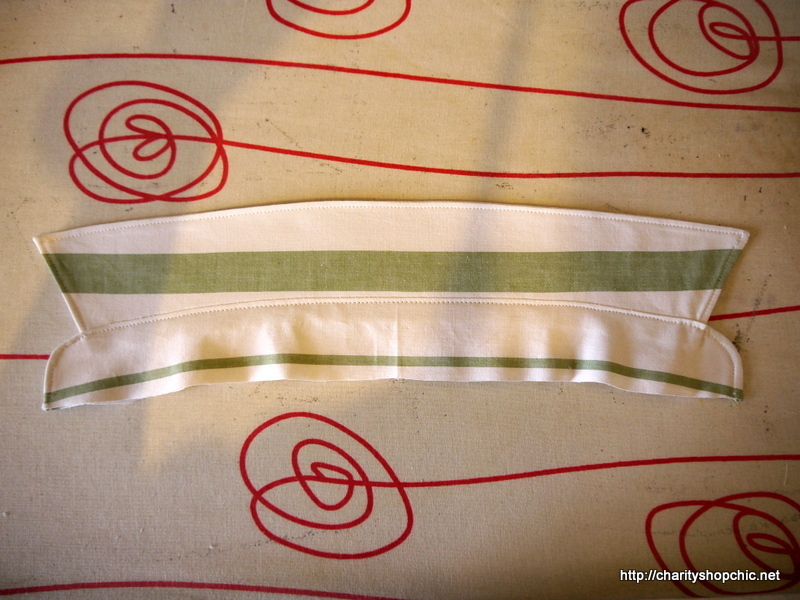 I placed the collar along a thick green stripe and the collar stand on a white stripe (thin stripe below is in seam allowance). Here’s a quick in-progress shot of the bodice. 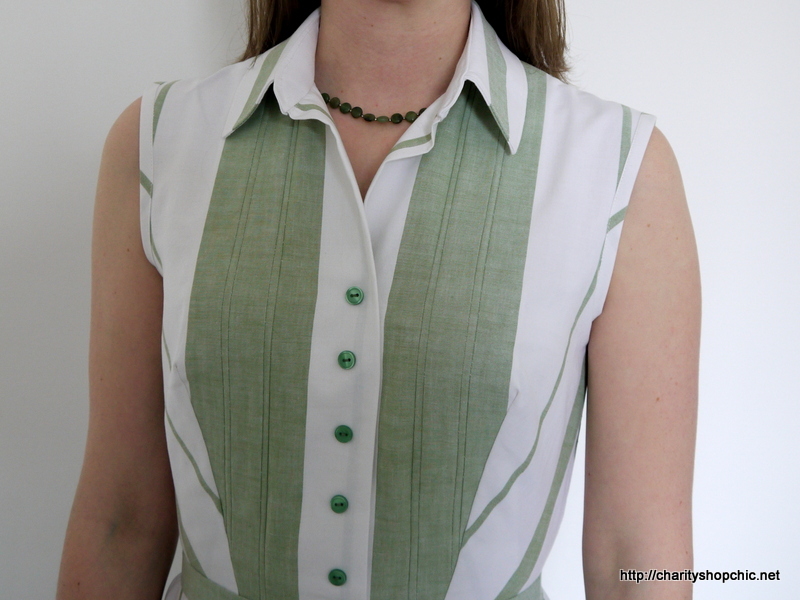 A happy coincidence has left a thin green stripe up the inside of each button placket. I love it! The original plan was to have the buttons go all the way to the neck, like Betty does, but I decided this thin green stripe was too good to lose. Another in-progress shot. You can see below I’ve added the skirt. I made box pleats around the thick green stripes but unfortunately there wasn’t enough material to make it all green at the waist! It was only a single sheet, after all. The result is not the fullest of full skirts, but still has a fifties vibe about it. The hem of the skirt is the bottom of the sheet. There’s a long zip up one side which unfortunately isn’t visible. I also added bias binding around the armholes. FYI, you have to make one piece of binding inside out in order to get a pair that are symmetrical. The final steps were to add five small green buttons, and to make a belt. 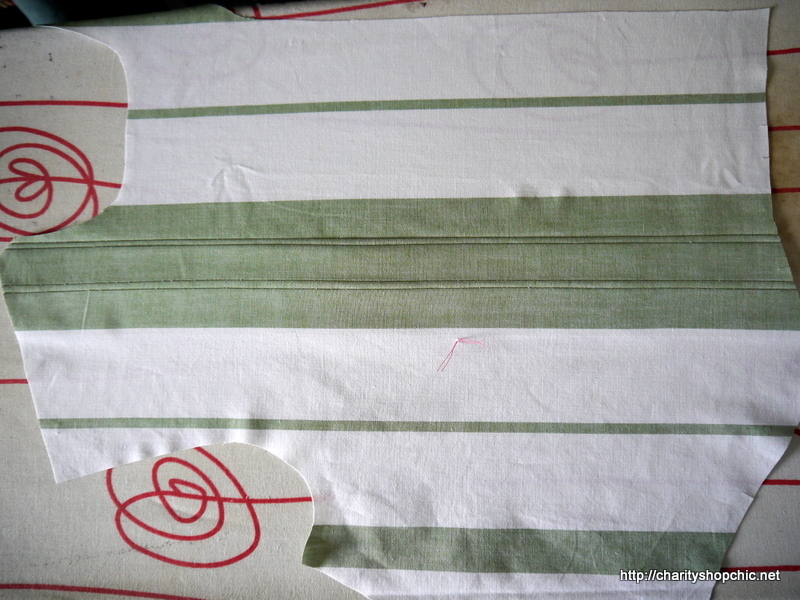 I interfaced a long thick green stripe and folded the edges back, using iron on glue rather than risk any topstitching. I had to buy a belt buckle but it wasn’t expensive and adds a great finishing touch. 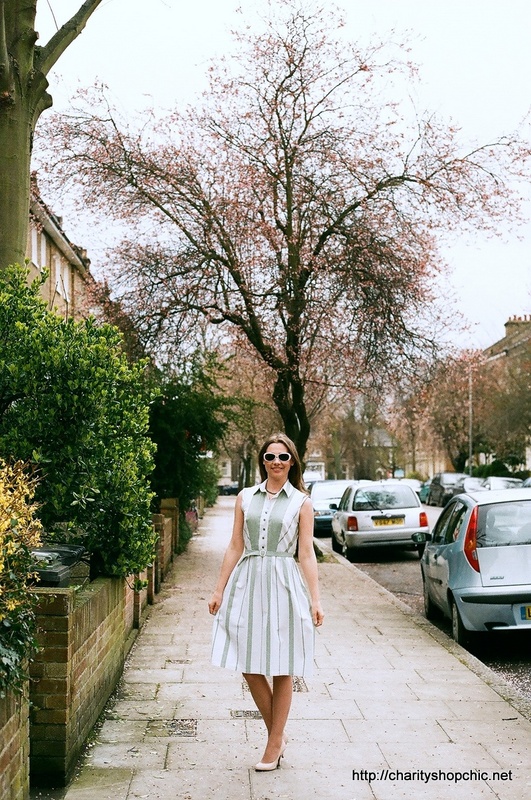 Before you say it – there was no room for a petticoat or crinoline under this dress! I did try it with a full petticoat and it looked silly, because the skirt isn’t full enough, you get a kind of bell-shape. Without the petticoat it doesn’t quite have the full-on fifties shape but I think I did reasonably well considering I only had a single sheet. Given that I’ll likely wear this on hot summer days, I won’t be layering up the skirt then anyway. I’m delighted with it, in case you can’t tell from these pictures. The linen is beautifully soft and very comfortable to wear. I love this so much!! It’s one of my favourite blog outfits to date. Really great job. Thanks Claire! Just waiting for the weather to get hot enough so I can wear it properly! Oh my gosh this is amazing, I love it!!! 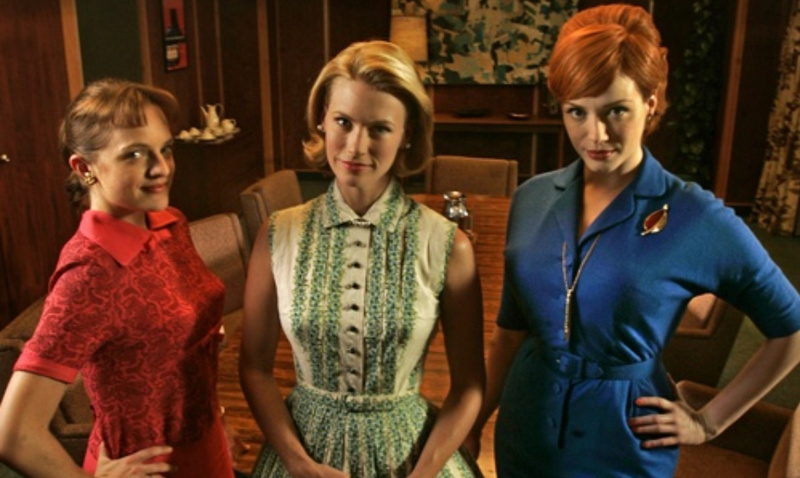 This is one of my very favourite Mad Men dresses too. I kind of miss all the 50s fashion as the series draws on…. 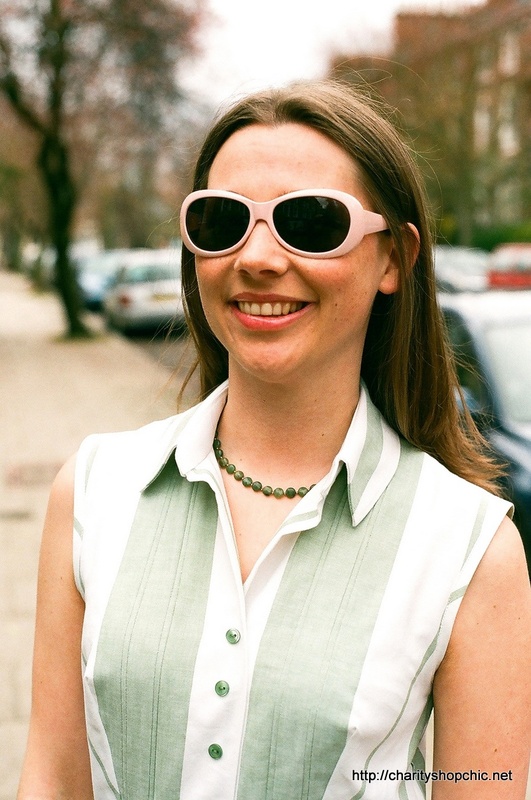 Thanks for the comment, Emily – I miss the earlier fashions too, but I do love the sixties. I’m a bit concerned that it’s starting to go a bit seventies and that has got me really worried! Fabulous dress, really love it. The small tags on the sheet are laundry marks, they’d have identified the customer the sheet belonged to when it was sent out to launder. Thanks so much, Kate! That’s interesting about the laundry tags, I hadn’t seen that before! lovely! can’t believe you go that out of a single sheet – and great work matching the stripe pattern! Thanks so much for leaving a comment, Gwenan. Really happy you liked this dress. Personally I find using other people’s patterns a bit restrictive! 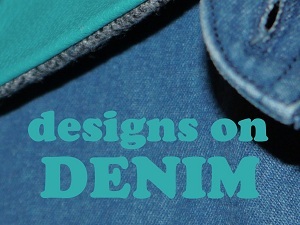 A good place to start might be adapting a pattern you already have? Have fun and good luck! Wow, this is gorgeous! I made a version of this dress (more of an inspired version than a copy) but yours is so much better, it’s stunning! Thanks Katy, I guess great minds think alike ;-) I will check out your dress now! ‘Horrockses’ would be proud of you…!!…. 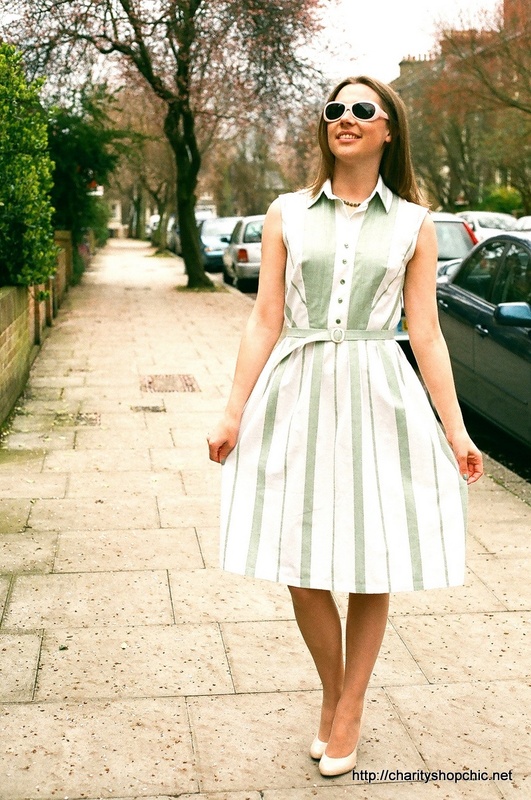 I’ve had a serious ‘thing’ for this particular Betty dress since first laying eyes on it! You are so, so clever to have replicated it using that sheet, it looks incredible! It also looks like a dress you’ll wear a lot…well I would for sure! Absolutely love it. And looking forward to meeting you tomorrow…eeep! Wow! This is defo one of my favourite outfits to date! It’s so pretty and I LOVE how the top came out. 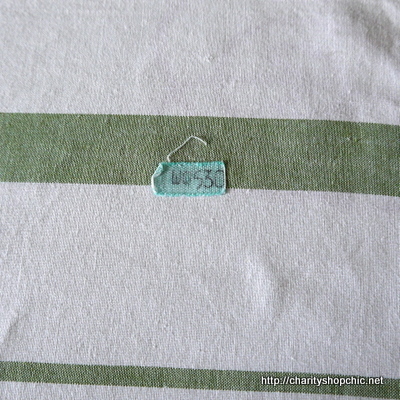 The labels with the numbers that are glued in are Laundry markers suggesting that this sheet may once have belonged to an institution or linen supply company of some kind – like the ones that supply hospitals and hotels – they frequently have markers to indicate which item goes to which customer and I’ve seen these before in hotel bedlinen. Thanks so much for commenting, Lex. That’s what I thought when someone commented on the laundry labels above – that it might suggest this was from a hotel. I can’t really imagine the green stripes and green ruffles in a hospital! In SE Asia, these kinds of laundry markers are put in your clothes when you send them to the dry cleaners, so these could be sheets that were owned by someone living in that part of the world. Hi Heather, that’s really interesting about the laundry markers, thanks for commenting. It seems like laundries here in Europe use the same type of tags. I do like the idea that the sheet is well-travelled though! Thank you Kerry! Really pleased you like it. I love it! I bet you will get a lot of use out it as it is perfect for the summer months. And I was impressed with the matching nail colour – somehow green never works for me! Thanks Claire, the green nail varnish was a bit of an experiment but I think it worked! You did an amazing job!! Love all your work, but this one is in the top 10 definitely!! Thanks so much, that’s kind of you! I think we used to call dresses like this “shirtwaists”. I agree, it’s 50’s. I don’t remember wearing a crinoline after 1960… and I notice you didn’t make one for yourself… and I think bodice darts always pointed towards each other back then. I’ve sewn them that way many a time. You are very talented – dress looks great – you encourage me to get out the sewing machine after many years, because now I want one, too! Absolutely gorgeous and flawless! I can’t imagine anyone thinking this came from a sheet! Serious talent, I’m blown away, and so happy I started following! Thanks so much! The stripes make it look a bit less sheet-y, I think. Stay tuned for more sheet and curtain projects coming up over the summer! Speaking of Curtain projects, my skills with a sewing machine are nowhere near yours – I can barely sew in a straight line, but I LOVE making costumes – halloween/fancy dress type things – Kimonos, medieval gowns etc. I have some ‘projects’ in mind but need a LOT of fabric (those long medieval dresses had a LOT of fabric) so I’ve been keeping an eye out for curtains and sheets in our local charity shops (there are a fair few of them in high streets in england these days). I’d love to see something like this realised by someone who actually knows what they are doing behind the peddle. OMG!! 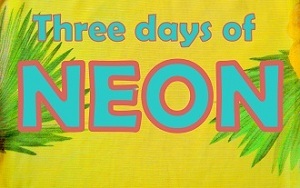 I just started following your blog. I love how your shirtdress turned out. The work you did on the bodice is spectacular!! p.s. I love making dresses out of old sheets. Me too, Trish, me too – curtains are great as well! Thanks for the kind comment! Thank you so much Liz! That’s the great thing about having a blog, it means I can point out these small details otherwise it’d only be me that sees them ;-) I agree that the less-full skirt modernises the look. This one will be worn this summer for sure! Absolutely fabulous. 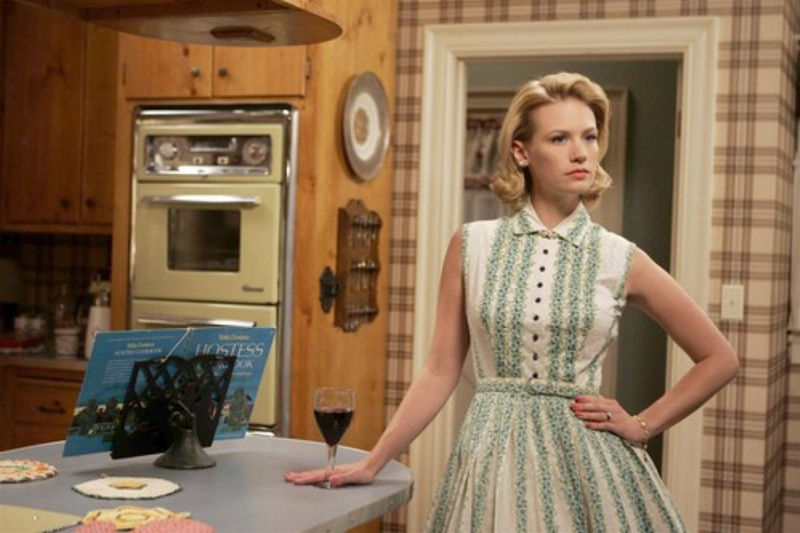 I love Mad Men clothes, and especially Betty. You nailed the look! I’m really inspired right now. Thank you Kaitlin! I’m a big Mad Men fan too. I can’t believe it’s taken me this long to make something Mad Men-inspired! Wow! Amazing dress! It fits you so beautifully,and the workmanship is stunning. I love your attention to detail. Thanks for always posting exactly how you make your refashions; I feel like I learn something new with every post. Great dress! Love the meticulous symmetry. Linen sheets – what a find. I’ve only ever found icky polyester. Awesome to see the details of the construction process, it’s my favourite part of your posts! 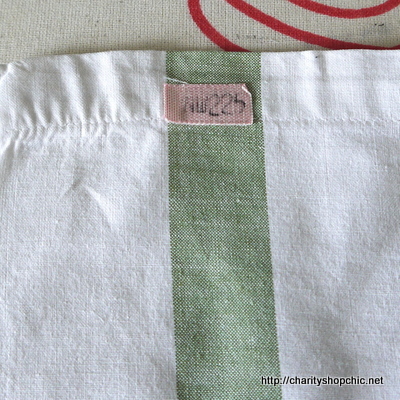 Thanks Sarah, yeah poly-cotton is certainly the norm – so satisfying to find something really special like this! Glad you enjoyed reading about the construction of this one, hope I didn’t mangle the explanation too much – it really was quite simple. Love it! The stripes on your version are perfect! Thanks Lindsay, it took a bit of careful planning but it turned out well! I adore this!!! You did a fabulous job!!! I want that dress for myself. :) I may have to try to make my own version. I think it looks better without the full skirt. It makes it more modern and wearable. Great job! Thanks so much Erinn, I agree on the full skirt. Definitely make one of these. Pretty much any striped fabric should work! 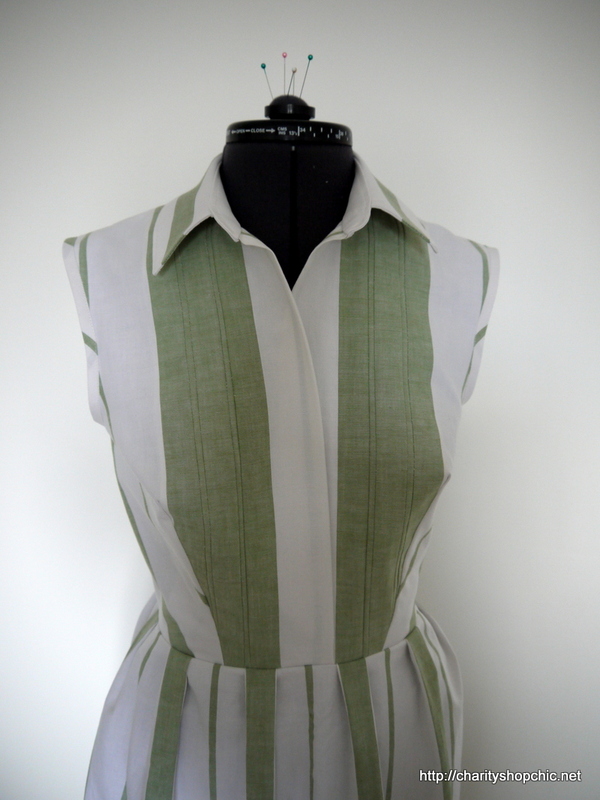 This looks wonderful,I love the solid area of green on the bodice, it helps to break up the stripeyness. 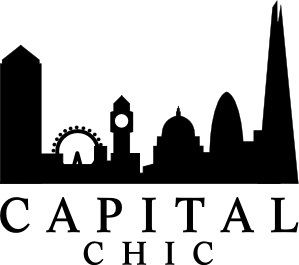 The linen will be so comfortable in summer too (if it ever comes to London). Thanks Joyce, I’m still hoping for spring to arrive, let alone summer! The dress is so fresh and up-to-date sans ruffles – love! Maybe you got a reply already, those glued labels are laundry tags. My mother used to send the sheets to launder as the washing machines in 60’s were not really equipped for doing large loads. They came back neatly folded and pressed, every single piece with a with a glued on fabric sticker with her order number on them. Thanks Juli, that’s so interesting about the laundry tags. I thought it may mean that the sheets had come from a hotel or something. Didn’t know that’s something most people used to do! This girl can sew! 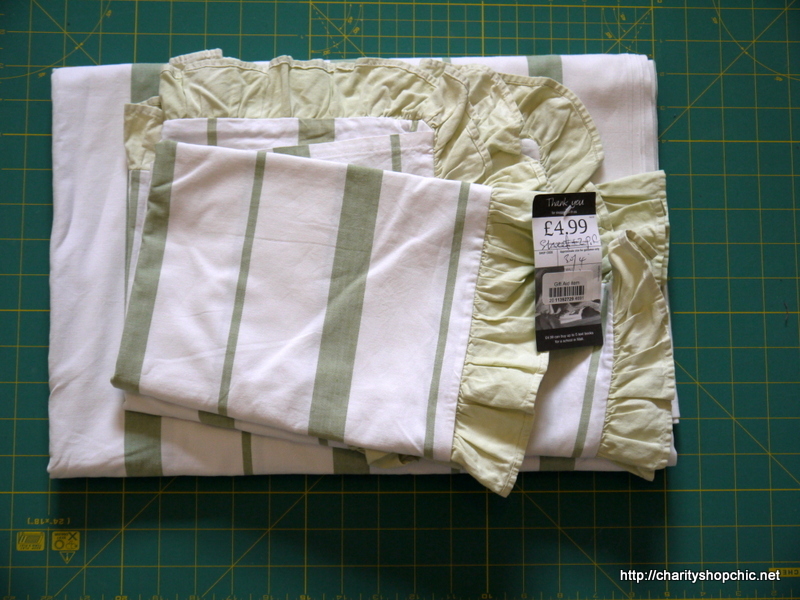 and very smart to buy used sheets or table clothes in linen. The price of linen is so high and the new linen is no where near the quality of the old linen. I have large linen table clothes that I bought in NYC where no one has a large dining room table or for that matter even a dining table. Some have become skirts and some are just great hanging to the floor on a side table. Hi Judy and thanks for the kind comment! Yes, the fabric is gorgeous and definitely too good to be a bed sheet! Gorgeous, looks so good on you! I have never watched Mad Men, so don’t have a comment about it relating to that, but as a dress, it’s a definite go to spring staple, I think. I’ve lurked around here for quite a while, but finally decided to officially “follow” you. I adore the stripe manipulations and the very flattering waist darts! Thank you very much, Jannapy! Good of you to de-lurk… I agree, I think the stripes make the dress! Amazing!! you are so cleaver. Your version of the dress is so much nicer than mine! I should have tried to find a fabric that wouldn’t flip out on me. OMG you made the same dress too!!!!! Great minds think alike ;-) I’m going to check yours out now! Beautiful job!! Are you self taught or have you had lessons you are so talented! Hi Diane, thanks for the supportive comment; I am a total amateur (self taught). Gorgeous work – and looks beautifully neat and fresh on you. Hi Dawn, yes, horsehair would help the hem stick out a bit. Since I just used the hem of the sheet though, I would have had to unpick it! I’m happy with this as a casual, comfortable summer dress for the moment so will probably leave it as is. Thanks for the suggestion though, great idea! I think this is my favourite thing you’ve posted yet! It looks fantastic. Thanks so much Kristina, it’s rapidly becoming a favourite for me too! Thats amazing, I love it! I love this dress! It’s so fresh and contemporary. I especially love the tucks on the bodice and how the solid green changes up the look of the striped part and creates a nice accent. Thank you so much! I agree, the bodice tucks really help add some interest to what would otherwise have been a straightforward shirtwaister. So impressed. Your drafting is really, really good. This looks fab! Thanks Naomi, hope this has inspired you to make something stripy! There you go again, wowing me with your skills!!!! Love the dress. When I was watching the episode with this dress I remember thinking it would be fun to try and copy. I have the perfect fabric for it, but i never got around to doing it. Kudos to you for actually doing it!!! Hi Beth, thanks for the supportive comment! I would love to see your version of this! But which episode is it from?! I couldn’t track it down, would love to know if you can remember? I know it’s from one of the earlier episodes, but I can’t remember which one. I have them all on my Kindle so I’ll see if I can find it for you when I have some time. You look better than Betty Draper and the dress itself is more stylish than the original.Congrats! Ha, thanks Eleni – that Betty takes some beating, she’s a super-stylish lady! Thanks for stopping by! Such a sweet comment, thank you! I’m really pleased with this dress, so I’m glad you liked it. So great to meet you yesterday. This dress looked amazing on you, and I love how much care and attention went into it. Perfect for wearing if you ever have a Betty-style breakdown and have to smash up the dining room furniture! Really beautiful dress… Thanks for coming on Saturday.. I have to admit your dress shone on Saturday, I sneakily kept looking at it and it’s gorgeous! So happy to have found your blog too! 22/04/2013 - 12:17 pm Helena A.
Yay! Love this dress and great job in placing the stripes!! Aw, thanks! It was great meeting you too! Lovely to meet you on Saturday – I spotted this dress in the group and thought, ah there’s Sally… first time I’ve ever recognised someone’s outfit before their face! But what a fabulous dress it is, and a great refashion. Thanks Amy, it was lovely meeting you too! Can’t believe you recognised the dress before you recognised me! This dress is beautiful. No one would ever guess that it was a sheet in its past life. I really look forward to seeing your latest creations. Aw, thank you Andrea! That is kind of you. Because it’s stripy, I think it looks less like a sheet. Wonderful job! Of all of the photos from JuliaBobbin I clicked on your dress first. 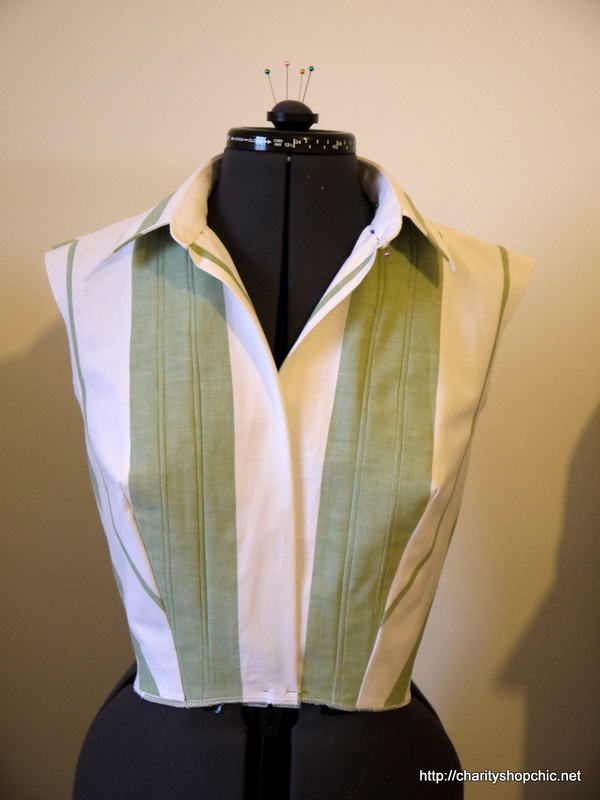 The bold green stripe down the front of the bodice is smashing! Love love love your dress! Aw, thanks! Really happy that you liked it. Yep, the green on the bodice front is my favourite feature too. What a beautiful dress! It’s so sweet and thank you for sharing the detailed construction notes. Hi Alice, so sweet of you to leave a comment, thank you! Hope you could follow my construction notes OK. I think that is one of the cleverest, thriftiest and most stylish refashions I’ve ever seen. And with stripes too!! Totally love it!! Thank you so much for the kind comment, Linda. I’m really happy with how this dress turned out, so glad you liked it too. Eddie’s Room on Facebook come over for some crafty ideas and conversation. Thank you so much! Glad you like it. Good buys in Oxfam are few and far between, but when you strike gold it’s awesome! You are amazing, this is just fantastic. As a newbie to sewing, I have been buying lots of bedding in charity shops to use to practice on. I have made lots of tote bags & cushion covers from old duvets. I now need to build up to making THIS GORGEOUS DRESS! You are so talented! 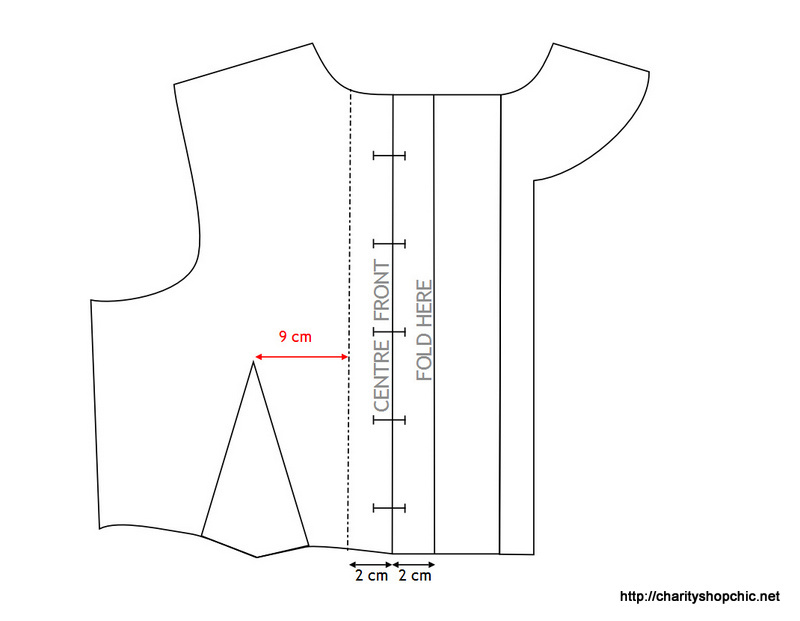 Thanks so much Rachel, this project would be great for all those sheets you have accumulated. Good luck! This is seriously amazing – you are so very talented, and truly inspirational! You’re very kind Miche, thank you! Wow what a talent, I live this dress. 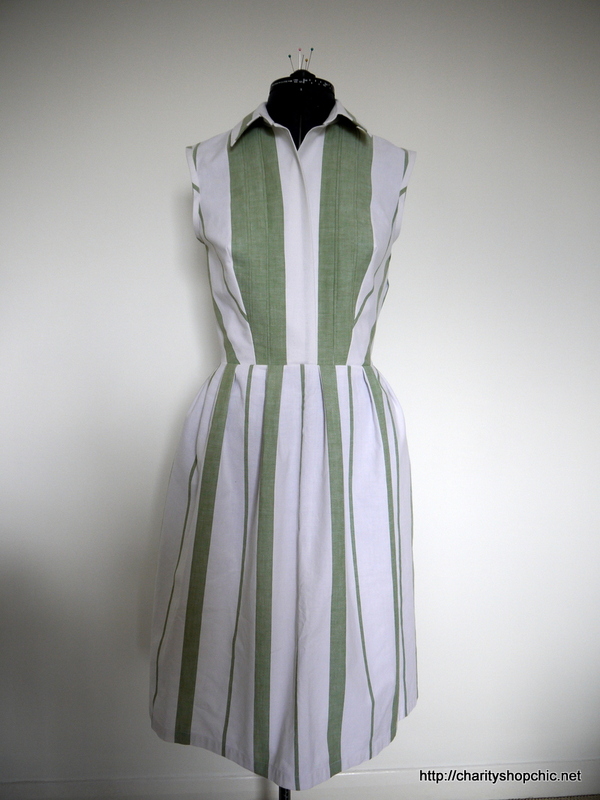 The pleating in the green is sensational! Thanks, Sarah! The pleats are a really nice but simple feature, I think. Betty wears this dress in season 3 episode 9. Awesome, thank you for commenting! Really good to know. I will have to go back and watch that episode now… so sad that the series has come to an end. This is one of the best upcycles I have seen. You have mad talent! Adore this dress!